You can read the original newspaper report here, with a picture of the watching crowds. The blazing crash meant a lot to the civilians below: it was the first zeppelin shot down over England after a more than a year of German air raids. As aircraft, Zeppelins were unreliable, and their damage was slight compared to the Blitz of the 1940s. But for civilians at home, the danger was strange and new. Silent and invisible against the dark night sky, pregnant with bombs, zeppelins were an unprecedented terror from above. 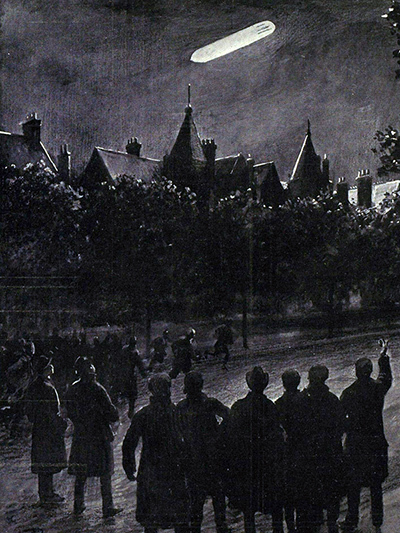 Searchlights and long-range guns had appeared in cities and along Britain’s coast, but without success. That night it was a pilot from a night squadron, Lt. William Leefe Robinson, who gunned the ship down from his plane. Lt. Robinson received a Victoria Cross for his feat. Later a prisoner of war, he died in 1918 from Spanish Flu. The zeppelin that crashed, the SL-11 (originally thought to be the L-21), had sixteen people on board. Below you can find more newspaper articles about Lt. Robinson and the incident which made him famous. Find more about zeppelins and air-raid panic here, or search for ‘zeppelin’ or ‘airship’ in the search bar above.